The official visual fan book! Gen Urobuchi has immersed himself in every aspect of the Thunderbolt Fantasy: Sword Seekers production, creating the premise, writing the script, acting as supervising director, and even partnering with production company Pili International Multimedia Group, renowned in Taiwan for both their quality and notoriety, to bring forth this all-new joint Japanese-Taiwan "Thunderbolt Fantasy Project." Two years since the broadcast of the television series first season "Thunderbolt Fantasy: Sword Seekers," the second season "Thunderbolt Fantasy: Sword Seekers 2" airs from October 2018, featuring an original story by Gen Urobuchi that incorporates characters from the "Thunderbolt Fantasy: Sword of Life and Death" theatrical release. 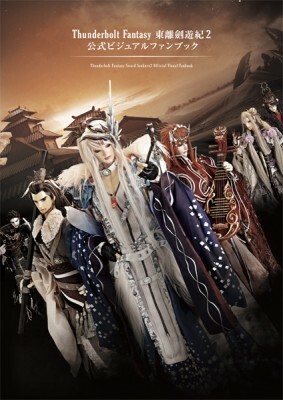 In the Thunderbolt Fantasy: Sword Seekers 2 Official Visual Book, you can enjoy both photos and illustrations of protagonists Lin Setsu A and Shou Fu Kan; Rou Fu You Ryou Ga, Katsu Ei Raku, and Shyou Kyou Ken from "Thunderbolt Fantasy: Sword of Life and Death;" new character Tei Kuu from Season 2, and others featured in the series. It's full of illustrations by character designers Sinov Mimori, Satoru Minamoto, and Namaniku ATK , as well as all new photos of the puppets, and is the first ever publication to include the puppets' design specs! In addition to visual media, both Gen Urobuchi and production staff write their answers to fan questions, as well as a special section only those who have watched Season 2 in its entirety could enjoy. Completely overseen and produced by Nitroplus, this is the authoritative compilation you won't want to miss. ・This product will be available for advanced sale at "Comic Market 95," held Dec. 29-31, 2018 at Tokyo Big Site. Please note that we don't accept order cancelation under any circumstances. ・ All images shown are for illustrative purposes only. Actual product may vary. Available for preorder from (Fri) Nov. 2, 2018 at 12pm JST. Scheduled to ship from (Fri) Jan. 18, 2019. * Please note that when ordered with other products, all products will ship together when they are in stock.